fertiliser and pesticide manufacture: the latter also controlled by seed corporations. One result is that many local breeds and food crop varieties have already been lost to us and the decline continues. This consolidation is relentless, with governments shaping policies to suit corporations and their investors, not citizens. 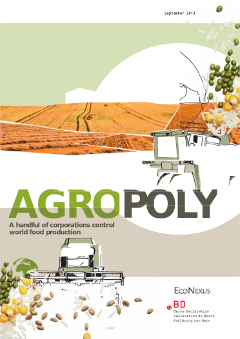 Agropoly highlights the pressing need to act now, working with peasant farmers and small-scale food providers to develop inclusive and just food regimes that provide nutritious food for all.